Survivor: Caramoan - Fans vs. Favorites (2013) - 17th place, 4th out. Medically removed for corneal abrasions in Episode 4, "Kill Or Be Killed" (Day 10). Caramoan Ep. 1 RC: "Water Slaughter" - With Julia, wins the first point versus Erik & Dawn, but Gota eventually loses. Caramoan Ep. 1 RC: "A Long Way to the Top" - With Reynold, gathers the sandbags, which Reynold tosses, as Gota wins. Caramoan Ep. 3 RC/IC: "Cell Block Sea" - Apart from complaining about the mask, an asset, but Gota loses. Caramoan Ep. 4 RC: "Head and Shoulders" - Gota barely loses, once again. Caramoan, Ep. 2: Four votes, from Hope, Allie, Eddie, and Reynold. Caramoan, Ep. 3: Three votes, from Hope, Eddie, and Reynold. Rob Cesternino at RHAP (3/7/13): "Talking With the Latest Players Off of Survivor: Caramoan"
Gordon Holmes at XfinityTV.com (3/7/13): "Shamar: 'I Do Not Take Any Crap from Anybody'"
Daniel Fienberg at HitFix.com (3/9/13): "Shamar Thomas Talks Survivor: Caramoan"
"Personal Claim to Fame: I’m very proud of becoming a non-commissioned officer in the Marine Corps. Being a leader at a young age and responsible for other Marines has changed my life for the better. Inspiration in Life: My Grandma, because she has been the most consistent person in my life. Her love is unwavering. She works hard and is an amazing example of what a person ought to be. Pet Peeves: My pet peeves are when people chew with their mouth open and when people are ignorant. I also can’t stand when civilians lack passion or enthusiasm about their jobs. 1) Ipod – music gives me energy. 2) Laptop – I want to remain connected to the 'outside world.' 3) Deck of cards – to play many different games. 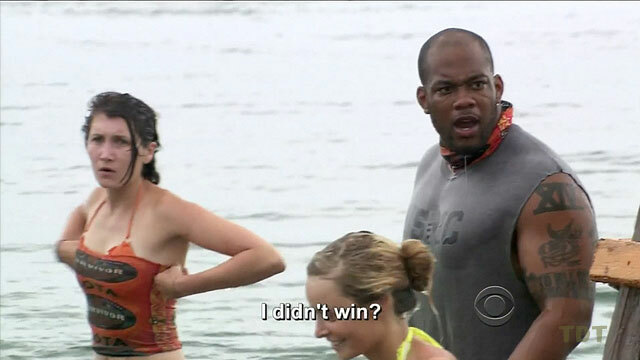 Survivor Contestant You Are Most Like: Rupert – because he played the game with honor. He has also worked with troubled youth. He shares my passion to help the community. Reason for Being on Survivor: My motivation for being on the show is to bring awareness to economical/social injustices and to bring honor and respect back to my community while inspiring the forgotten. Why You Think You’ll 'Survive' Survivor: Because of my physical strength, ability to be a team player and leadership. I’m also good at making quick and sound decisions. Why You Think You Will Be the Sole Survivor: I will be the final Survivor because within my life I have lived in many places, enabling me to relate to the surroundings and the people that occupy them. Furthermore, my experience in Iraq has given me the confidence to face anything."